Jennifer Shaffer, Psychic Medium A.J. 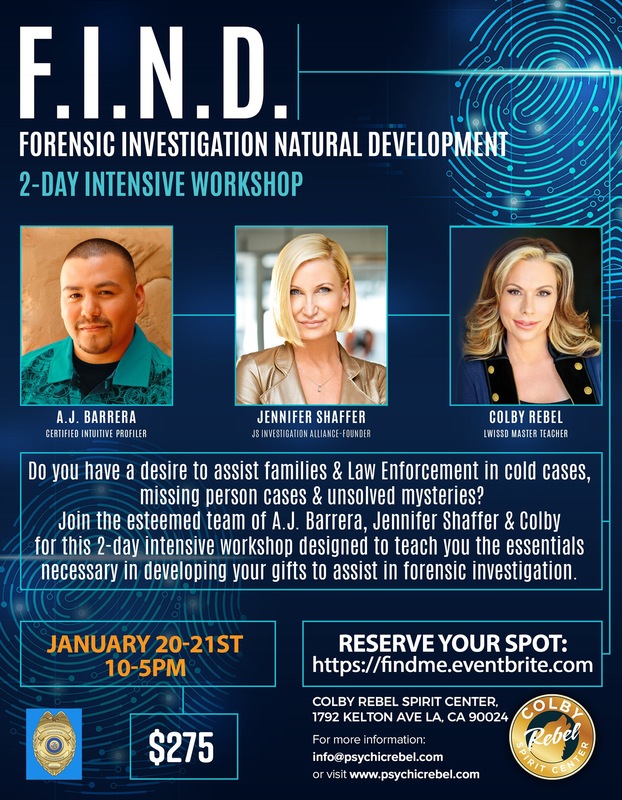 Barrera and Colby Rebel – Forensic Investigation Natural Development 2 Day Intensive! Do you have a desire to help law enforcement in cold cases, missing cases & unsolved mysteries? We are excited to offer this intensive 2-day workshop with top intuitive profilers Psychic Medium A.J. Barrera and Colby Rebel and myself where we will cover everything you need to know about how develop your mediumistic & intuitive gifts to assist in cases. There is an EARLY bird pricing of $249 that ends Oct. 31st. Click the link for more info: https://findme.eventbrite.com *Space is LIMITED.